The use of pure, all-natural beef tallow dates back hundreds of years. 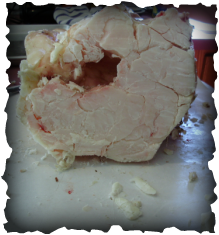 In the pioneer days of the Wild West, tallow was readily available to the average farmer, as cattle was raised in abundance during that time. Those folks were a hardy bunch, and used every part of an animal they could. The meat was obviously eaten, and the subsequent fat was rendered and clarified for use in soaps and candles, among certain other by-products. Soaps were made with tallow, water, and lye. The tallow was rendered and clarified in the same way as for candles, and used in making the soap. Tallow makes a very hard, long-lasting bar of soap. With a rich, creamy lather, this soap makes a good facial soap, and is also good for body, hair, clothing, and even dishes! Today, we obtain household lye from hardware stores in crystal form. Back then in the west, you had to make your own, or possibly purchase some from a local mercantile. It was a long process of leaching water through hardwood ashes in a bucket. The liquid coming out of the bottom spigot is what was used. Crack an egg into the liquid, and if strong enough for soap, the egg would barely float. If not, the liquid would go back through the ashes. This kind of liquid lye only makes soft soap. To create the more potent lye crystal, the early pioneers would boil the water content out, to leave behind the ashy substance. The pioneers would mix water, tallow, and the afore-mentioned "liquid" lye in a heavy cauldron over a fire and slowly mix it all day keeping it warm til it was thick. Then it would cool for about a day, and be available for use in washing clothing, tools and implements, and dishes. They did not use this soap on their bodies, as it was harsh on the skin. Even their clothing only got washed if it really needed it! Instead, they would use clean water and fragrant oils on themselves. To make hard bar soap, they would add handfuls of salt to the pot of warm soft soap and once it cooled, a hard layer would form on top. It would be skimmed off and cut into usable chunks, much easier to store. 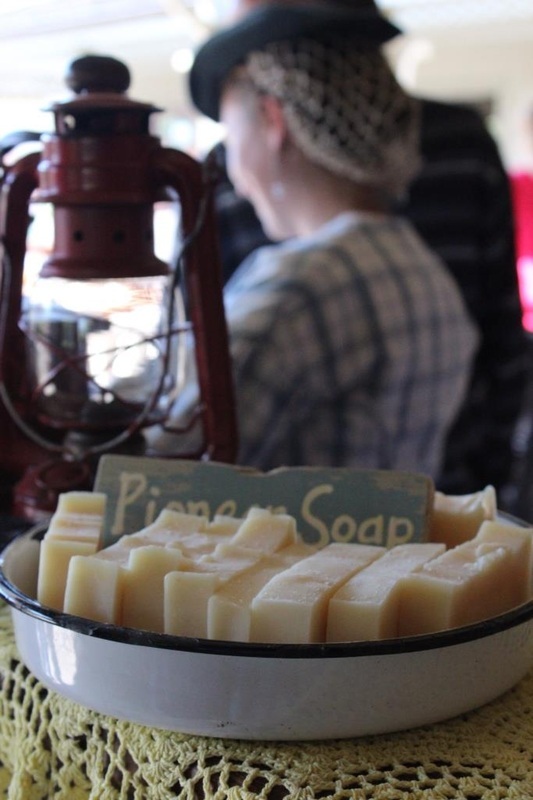 We make our Pioneer Soap by using crystal lye similar to that available to those in the east and to those who could purchase it in a local mercantile.